Eugene N. Edstrom, age 97, of Columbia Heights passed away on Thursday, December 27, 2018. He is preceded in death by his loving wife of sixty-six years Marianne; parents and siblings Ted Edstrom and Delores Leary. Gene was born in Minneapolis in 1921 and his family soon moved to Columbia Heights where he would spend most of his life. 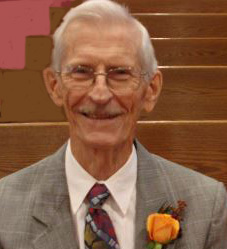 He was a faithful ninety-year member of First Lutheran Church of Columbia Heights serving in many ways over the years. As a graduate of CHHS class of 1940, Gene enlisted in the Army in 1942 serving in Guam as an airplane mechanic from 1944 until the end of the war. Gene and Marianne were married in 1944 before he left for Guam and upon his discharge in 1946, he enrolled at the U of M. In 1949, he graduated with a degree in mechanical engineering and in 1951, Gene joined Honeywell for a 35-year career. His most challenging and rewarding work was as a production engineer, building ground test stations for the new F-15 air superiority fighter. Gene was a very hard worker his whole life with an agile, inquisitive, mind who lived by the motto.....”if anyone else can figure it out, so can I ”. This can-do attitude allowed him to add an entire second floor to their family home doing all the mechanical, electrical and construction work himself. Gene was always willing to help his adult kids with any project such as building decks, or repairing broken sewing machines. It seemed that there was little that he could not figure out how to do. Gene was an active member of the Kiwanis club for many years. No meeting could start without Gene leading the members in a patriotic song. He worked at the recycling center in Columbia Heights as part of his Kiwanis service. Gene and Marianne played in bridge clubs for many years and together delivered Meals on Wheels later in life. Gene also served on the Columbia Heights High School Board of Education for six years. Gene's greatest and most rewarding life experience came as a loving husband to Marianne and father of his three daughters and son. Family birthdays and baptisms, weddings and holidays were faithfully celebrated by Gene and Marianne. Life will not be the same without Gene but we are comforted to know that he loved the Lord and we will all be united once again. Gene is survived by his children, Jennifer (Robin) Turnwall, Rebecca (David) Fannon, Deborah (Robert)Holt, Fred (Terri)Edstrom; grandchildren, Geoff (Jill) Fannon, Eric (Amanda)Fannon, Tiffany(Nick)Armstrong, Travis(Maggie)Holt, Tara(Jake)Dalbec, Andrea Holt, Alicia Edstrom, Jonathon Edstrom, Erica Edstrom; great grandchildren Ella Fannon, Evan Fannon, Ethan Fannon, Norah Armstrong, Nissa Armstrong, Maggie Dalbec, Lucy Dalbec. A visitation will be held at Miller Funeral Home 6210 Highway 65 NE, Fridley; on Thursday January 10, from 4:00-7:00 pm. A funeral service will be at First Lutheran Church, 1555 40th Avenue NE, Columbia Heights; on Friday, January 11, at 11:00am with a visitation one-hour prior. In lieu of flowers, memorials preferred to First Lutheran Church, Columbia Heights.